Annual Meeting with Special Breakfast! On Sunday, January 27th, we’ll celebrate another year in the life of our church! We’ll recognize our ministries and outreach programs and celebrate all the signs of new and sustaining life at Grace. During our regular coffee hour time, we’ll have our Annual Meeting — including nominations for new council members, reports from our committees and teams, and looking over our proposed 2018 budget. Amy and Marko Fields are coordinating a breakfast for us – they’ll have everything taken care of, so we get to sit back and enjoy the good food. Fri June 22, 9-5 and Sat June 23, 9-4.
in the Gustavus Adolphus Church parking lot. All proceeds will be given to the Little Kitchen. All leftover sale items will be put in the Grace Lutheran Church garage sale in July. All questions to Beth Breiter at bbreiter92@gmail.com. Ways you can help make our fundraiser a success! ​Volunteer: We’ll need helpers to organize the sale, set up sale on the evening of Wed 6/20, work the sale both Friday and Saturday and pack up and haul away leftovers at the end. If you’re an organizer, a worker bee, or a people person, we want you. Kids are welcome helpers too. 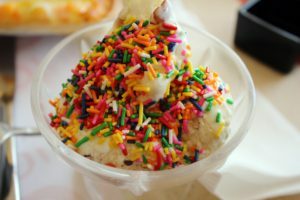 Community Dinner with Ice Cream Social and Live Music! This month, our regular community dinner is followed by an ICE CREAM SOCIAL with live music! Join us at 5:30pm for dinner and 6:30pm for ice cream and music. Set aside Saturday, November 7, 2015 to attend and/or volunteer at our annual Sauerkraut Supper fundraiser. We will start the planning for this fundraiser shortly. Please let Kathy Schadendorf at 763-7817561 know if you are interested in being part of the planning team. More to come!!!! 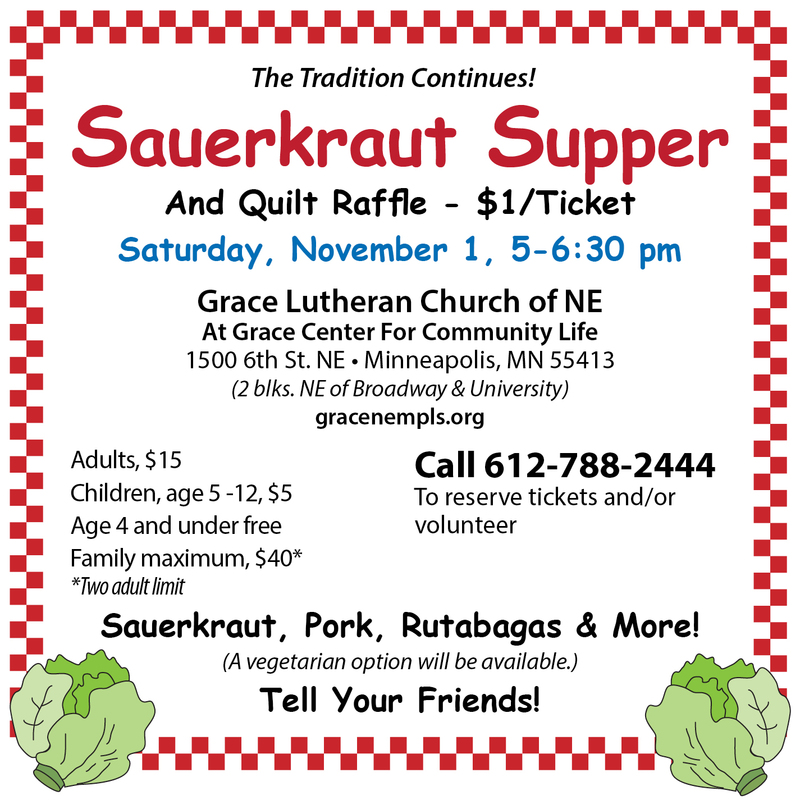 Our annual Sauerkraut Supper will be held on Saturday, November 1, 2014 from 5-6:30 PM! Call the church office at 612-788-244 to reserve tickets and/or to volunteer.